Neadvance is introducing the next generation of its tire marking inspection solution. The NIPRO-351 tire marking inspection system can inspect up to 10,000 parts per shift. The modular system can be easily integrated into an existing tire production line and supports all standard industry marking types, including dots, doughnut, NN, PP and more. The new Warp-Compensator+ eliminates false negatives caused by warp of the tire during conveying and therefore reduces unjustified rejections. 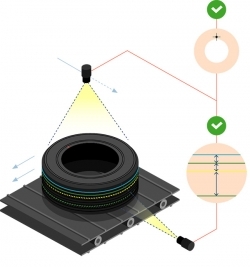 This technology was designed to solve typical conveyor issues and increase the range of tire dimensions that can be processed with one intelligent vision system. The combination of state-of-the-art cameras, high-power LED illumination and Neadvance’s deep learning algorithms allows better inspection results and rapid cycle times. The redesigned and improved user interface boasts excellent flexibility and is now easier to use. The system can collect all defined data and automatically create the reports for process improvements or traceability that are needed for successful Industry 4.0 with standardised interfaces.